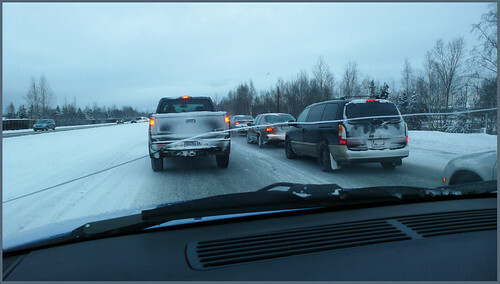 Stop and go traffic on the New Seward Hwy. just south of Dimond. Flash snowstorm in the afternoon made a glazed mess for rush hour, and wreckages ensued. Only minor inconvenience for me, arriving a bit later in Girdwood than planned. I passed a pickup truck flipped completely over on the side of the road.